Menulog delivers for Lamb On Chapel so you'll be able to track your courier on a map. Lamb gyros, lettuce, tomato, onion, and tzatziki. Chicken gyros, lettuce, tomato, onion, and tzatziki. 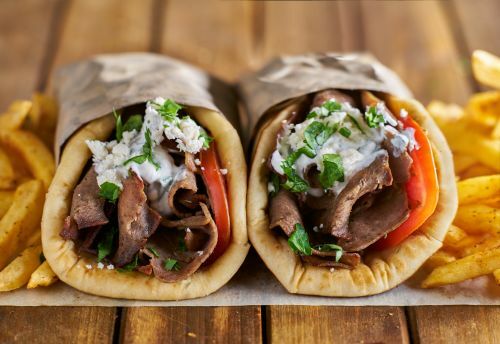 Combination of lamb and chicken gyros, lettuce, tomato, onion, and tzatziki. Lamb or chicken gyros, lettuce, tomato, onion, tzatziki, feta cheese, and olives. Lamb or chicken gyros, chilli sauce, chilli flakes, jalapenos, cheese, lettuce, tomato, and onion. Lamb or chicken gyros, mayonnaise, cheese, pineapple, lettuce, tomato, and onion. Lamb or chicken gyros, ketchup, mustard, fries, lettuce, tomato, and onion. Lamb or chicken gyros, bacon, egg, cheese, BBQ sauce, lettuce, tomato, and onion. Lamb or chicken gyros, side Greek salad, pita bread, choice of dip, and fries. Lamb or chicken gyros, fries, cheese, BBQ sauce, chilli sauce, and tzatziki. Mixture of lamb, and chicken or either. 1 Large Lamb, 1 Large Chicken Container, 1 Large Salad, 1 Mixed Dips, 5 Breads, 1 Serve Dolmades, 1 Serve Sausages, 1 Saganaki, 2 Large Fries, and 1 1.25 liters Drink.